The 2015 Journal Citation Reports® have just been released and we are pleased to announce that CrystEngComm received an Impact Factor* of 3.849, whilst being the biggest publisher of innovative research covering all aspects of crystal engineering. What’s more is that researchers around the world cited CrystEngComm articles 25,875 times last year, making us the second most cited journal in the crystallography ISI category! We are truly grateful to all of our authors, referees and readers for contributing to the journal’s continued success, as well as our Editorial and Advisory Boards for their hard work and dedication to the journal. Thanks to you, CrystEngComm has continued to grow from strength to strength and become the journal of choice for many authors and readers! We invite you to submit your best work to CrystEngComm! Also of interest: Find out how other RSC journals are ranked in the latest Impact Factor release. The 2012 Journal Citation Reports® have just been released and CrystEngComm has received its impact factor of 3.88. We would like to thank all our authors, referees and readers who have contributed to this success, as well as the hard work from our Editorial and Advisory Board members to make this journal an important resource in the field of crystal engineering. Check out our journal hompage for the latest news in the design and understanding of solid-state and crystalline materials, or submit your paper to us to ensure that it gets the attention it deserves. The 2011 Journal Citation Reports ® (Thomson Reuters, 2012) have been released and CrystEngComm has received a 5 year impact factor* of 4.02 and an Immediacy Index** of 0.844, the highest Immediacy Index for any crystal engineering journal! 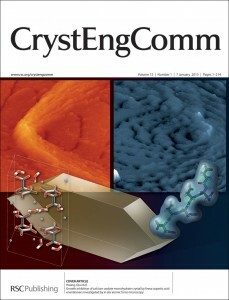 For more information about CrystEngComm, including how to submit your research, check out the journal homepage. *A 5-year impact factor is the average number of times articles from a journal published in the past five years have been cited in the JCR year. It is calculated by taking the number of citations in the JCR year to articles published in the preceding 5 years and dividing by the number of articles published in the previous 5 years. ** The Immediacy Index is a measure of how topical and urgent work published in a scientific journal is. It is measured by dividing the number of citations made to articles in a journal in a given year by the number of citeable articles published in the journal for the same year. 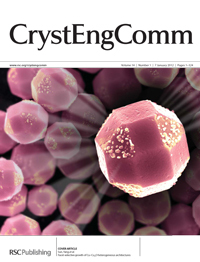 CrystEngComm has a new Impact Factor! CrystEngComm’s 2010 Impact Factor has been announced as 4.00 in the 2010 Journal Citation Reports released by Thomson ISI earlier this week. Since its launch in 1999, CrystEngComm has grown from strength to strength, to become the journal of choice for many authors and readers working in the crystal engineering and nanocrystal fields. We thank all our authors and referees who have supported the journal since its launch. Please visit our website to learn more about CrystEngComm, or submit an article today. Information about the latest impact factors for other RSC journals can be found here. In celebration of our impressive performance in the recently released ISI® impact factors, we are offering FREE online access to the top ten most cited articles in 2009 published in CrystEngComm during 2007 to 2008. These excellent papers contributed to our remarkable growth. Newly-released ISI citation data confirms CrystEngComm is the leading journal in its field with an impact factor of 4.18. This impact factor establishes CrystEngComm’s position as the best journal for crystal engineers. Why not take a look for yourself and check out the big name authors and hot topics? Lone pair–π interactions: a new supramolecular bond? CrystEngComm Impact Factor Soars to 4.2! 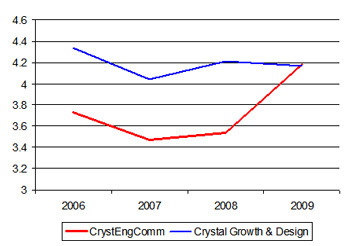 CrystEngComm has achieved its highest ever impact factor of 4.183, according to 2009 data released by Thomson ISI on 17th June 2010. We would like to take this opportunity to thank all our authors, referees and readers for your continued support which has enabled the journal to continue to grow in impact. The impact factor is a measure of the number of times an “average article” in a journal has been cited in a particular year. The impact factor for 2009 is calculated from the total number of citations given in 2008 to articles published in 2008 and 2007, divided by the number of articles published in 2008 and 2007. With its high impact factor and fast publication times, CrystEngComm remains the obvious journal of choice for publishing the most current research relating to the design and understanding of the solid state.